Some distilling experts believe that aging Bourbon an extended time in the barrel is not always a successful strategy when it comes to adding palatable flavor. The fear is that too much oakiness and tannins will be present once it’s bottled. But older whiskies sure do capture the attention of the consumer. With the success of brands like the Pappy Van Winkle 15, 20 and 23-Year-Old Bourbons and the Elijah Craig 18 and 20, 21, 22 and 23-Year-Old Bourbons, it seems the trend of releasing an extra-aged whiskey is one that will be around for a while. What’s being called the oldest Bourbon ever bottled at 45 years in a barrel, the Final Reserve James Thompson & Brother Kentucky Straight Bourbon Whiskey is not only going to pack a punch of flavor due to its extended stay in those oak casks according to its owner, but is a Bourbon steeped in history as well. The story starts out around 1870 when a 16-year-old Irish immigrant named James Thompson came to America while fleeing the potato famine. According to James’ grandson, James “Buddy” Thompson, in 1872 James formed a partnership with George Garvin Brown to buy and sell sourced whiskey. After close to two decades in business, they decided to go their own ways, each forming their own distilling powerhouse. Brown started what is still a very successful company in Brown-Forman, and James started James Thompson and Brother. In 1901, James decided to purchase a distillery in Owensboro, Kentucky making him an actual producer of whiskey. This transaction established Glenmore Distilleries, the name chosen by James because of his Irish-Scottish heritage. Some of the more popular brands produced at Glenmore during its existence were Kentucky Tavern and Old Thompson. After James’ death in 1924, his son Frank B. Thompson took over and later the company would be run by his son, Frank Thompson Junior. Frank Jr. would fall ill soon into his tenure though and the reigns of the company were handed off to Buddy in 1974. Prior to Buddy’s appointment as head of the company, Glenmore purchased the Yellowstone Distillery and brand out of Louisville in 1944. This distillery is the source of the Final Reserve James Thompson and Brother Bourbon that Buddy plans to release in early 2018. When Buddy took over Glenmore, they were also importing the Remy Martin Cognac from France into the United States. Buddy took notice to the commemorative bottlings that they were releasing for some of their special Cognacs. He decided to put back some Bourbon that could possibly be bottled for the millennium, celebrating the year 2000. Buddy says he personally purchased the barrels to make it an easier transaction since they were not going to be earmarked for any bottling in the near future. 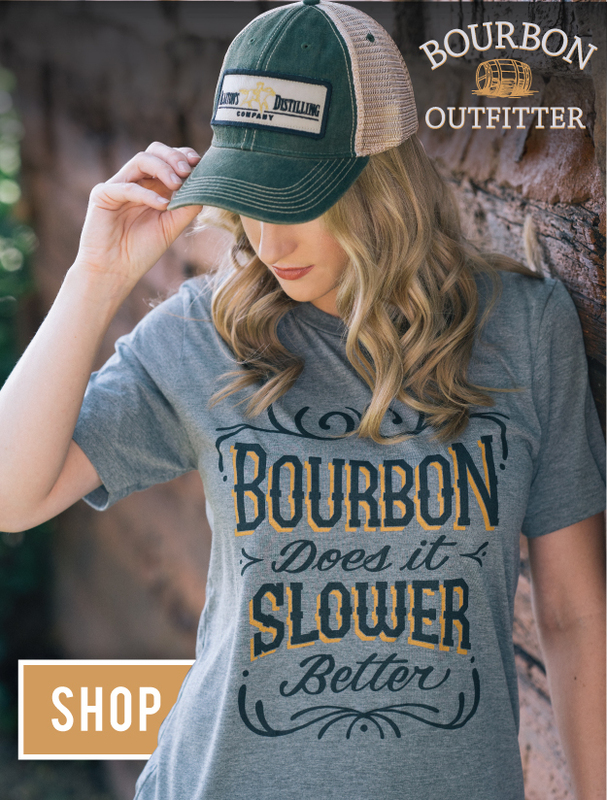 The stock came from the Yellowstone Distillery and probably would have gone into bottles of Yellowstone Mellow Mash Bourbon, a brand Buddy says was a boutique Bourbon that was popular in Japan and New York. This Bourbon was barreled at 107 proof and consisted of a mashbill of 75% corn, 13% rye and 12% malted barley. As fate would have it, Buddy wouldn’t get an opportunity to bottle his barrels for a special release under the company his grandfather started. The 1970’s and 80’s saw several distilleries close their doors, and both Glenmore and Yellowstone were no exception. In 1991, Guinness purchased the remaining Glenmore assets and brands which would be grouped into the Schenley merger and eventually known as United Distillers. United Distillers then sold their Glenmore brands to Barton Brands in 1995. 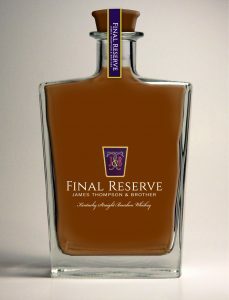 The Final Reserve James Thompson and Brother Bourbon will be offered in three different vintages. The first offering is the 45-Year-Old Bourbon which will be launched March 1st and available to purchase at the Frazier History Museum in Louisville, which is during the week of the Bourbon Classic event. 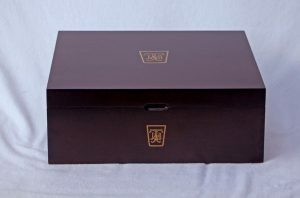 250 commemorative boxes will be filled with a 750ml bottle of the 45-Year-Old Bourbon along with a 100ml bottle so folks can taste it right away if they feel they do not want to open the larger bottle at first. 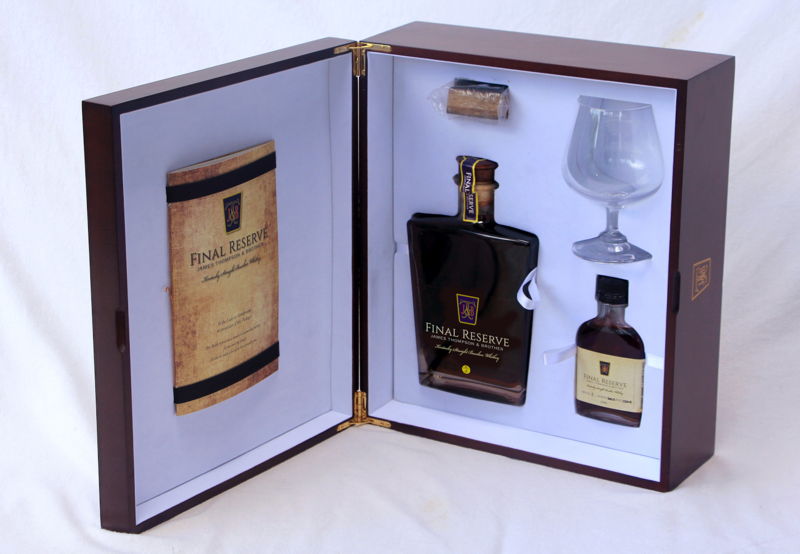 A small piece of one of the barrels will also accompany the package. This 115-proof Bourbon is expected to retail for $1,800. 100% of the profits from this bottling will be going to charity, with 90% going to the Congressional Medal of Honor Foundation and 10% going to the Frazier History Museum. If you are interested in receiving updates about the release of these bottles, click here. A 43-Year-Old Bourbon under the same name is scheduled to be released during the Bourbon Affair this coming summer and a 41-Year-Old vintage should be released during the Bourbon Festival in Bardstown in September of 2018. So how does, what Buddy claims is the oldest Bourbon ever bottled taste like? According to him, its characteristics include, “A fabulous aroma and an expected deep mahogany color. The tannins are strong, but I like a bite with my Bourbon.” If the bite is too much, he has an old technique that might help with that also. Buddy recommends adding just a few drops of sherry in any liquor you feel had too many tannins in it. He claims it will open the Bourbon right up and smooth out any “bite”.